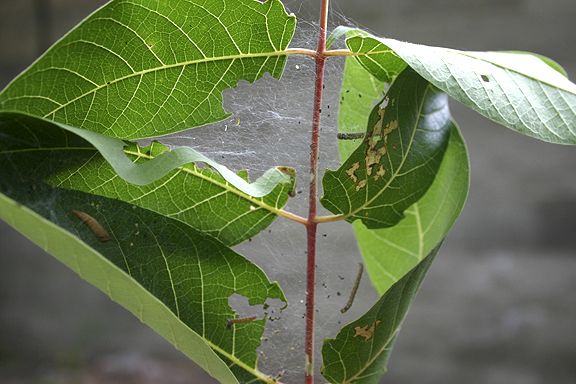 "Where microleps hang out on the Web"
Ailanthus webworm, Atteva aurea (Attevidae); larvae and pupa in web on leaves of tree of Heaven, Ailanthus altissima (Simaroubaceae). The purpose of this site is to encourage the study of eastern-Nearctic microlepidoptera, by offering information on technical aspects of study, and by providing written accounts and (especially) images of the immature and adult stages of microlepidoptera found in the target region, with emphasis on species found in Illinois. Because of the faunistically pivotal size, shape, and location of Illinois, much of the information presented here will be relevant to large areas of the USA and Canada east of the Rocky Mountains. In its finished form, this site will represent the first comprehensive (i.e., including all families, and covering immatures as well as adults) single-source illustrated reference ever to be undertaken on the subject of eastern-Nearctic microlepidoptera. The immature stages, larval evidence, and even the adults of many of the species that presently are depicted on this site are illustrated here for the first time in any medium. The main part of the site is the ILLUSTRATED GUIDE, which features annotated images of the various microlepidoptera groups, as represented by species that are known or likely to occur in Illinois. Please feel free to "go into wandering phase" and browse the Guide! Ultimately, this site will also offer resources such as a "Techniques" section, with instruction on observing, collecting, rearing, processing, preserving, and documenting microlepidoptera, and a "Literature Cited" section, with a list of publications that are referred to throughout the site. In the meantime, as regards literature references, clickable links to citations of one or more appropriate references already are imbedded in the text of some pages. As with the centralized "Literature Cited" section, more of these individual references will continue to be added as the site is developed.